MC Anna, MC A95, MC Windfeld Ti, Cadenza Series,MC A90, MC Windfeld, Kontrapunkt series, MC Jubilee. Audio Technica AT-HS1 Universal Headshell Cartridge Headshell AT-HS1 10g DJ Style 1/2&r.. Audio Technica AT-HS10BK Cartridge Headshell Cartridge Headshell AT-HS10BK The lightwei.. Audio Technica AT-HS10SV Cartridge Headshell Cartridge Headshell AT-HS10SV The lightwei.. Audio Technica AT-LH13/OCC Cartridge Headshell Cartridge Headshell AT-LH13/OCC 10g DJ S.. Audio Technica AT-LH15/OCC Cartridge Headshell Cartridge Headshell AT-LH15/OCC 15g Tech.. Audio Technica AT-LH18/OCC Cartridge Headshell Cartridge Headshell AT-LH18/OCC 18g Tech.. Audio Technica AT-LT13A Cartridge Headshell Cartridge Headshell AT-LT13A 13g headsh.. Audio Technica AT-MG10 Cartridge Headshell Cartridge Headshell AT-MG10 10g Magnesium Bo..
Ortofon 2M BlueEliptical Diamond + SH4 Headshell Eliptical Diamond 2M BlueE..
Ortofon 2M Red Eliptical Diamond Eliptical Diamond 2M Red 2M Red features: ..
Ortofon LH-10000 Aluminum alloy with Zinc Headshell Exceptionally high quality headshell made usi..
Ortofon LH-2000 Headshell High quality headshell designed specifically for HiFi applications ..
Ortofon LH-6000 Headshell High quality headshell is recommended for the MC Windfeld Ti and the Ca..
Ortofon LH-8000 Headshell High quality handmade wood-based headshell with a polished brass finger..
Ortofon LH-9000 Headshell Exceptionally High quality carbon fiber headshell. 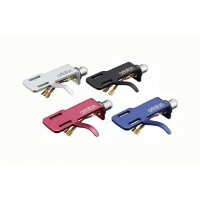 ..
Ortofon SH-4 Headshell High-quality, solid headshell for variety of applications &..